A Bookish Mess: SBPT #3: The Cozy Little Book Nook! I am sharing with you Brooke from The Cozy Little Book Nook! I wanted to get a feel of Brooke's blogging area! I asked her to give us a little insight to where she blogs, her favorite place to read and other things like that! I hope you all enjoy her post as much as I do! You can stop in and visit Valerie from He Said Books or Me to see my post from this week! It is all about how I manage blogging and my hectic life! 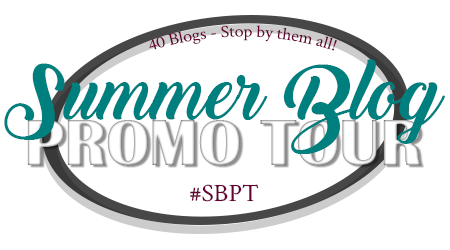 I am hosting this during the SBPT Summer Blog Tour! Make new friends and enter to win a Gift Card! Hi everyone! I’m Brooke from The Cozy Little Book Nook! So for this post, Peyton asked me to basically take pictures and talk about my books, the space I blog and stuff like that. I hafta admit, I really had no idea where to take this post, but I wound up actually really liking it! My bookshelf isn’t something that I take pride in at the moment. I mean, I used to have a bunch of middle grade chapter books (that you know, that were all the rage back when I was actually in elementary and middle school) but now that I’m in high school, those books aren’t something you want the world to know you have, you know? I recently cleaned out this space and actually most of the books i have on there are the books I bought or received after I started blogging. Before then, I usually bought all my books on the kindle or borrowed them online since my library has this really cool system of checking e-books. I don’t really have a favorite place to read. Since I started my blog in the middle of the school year, I didn’t have much time to just sit down and read. I read in the weirdest times. I remember specifically that I read Cinder over 2-3 days, exclusively on my morning and bus rides (those rides are like an hour long each way). Many other books I read during lunch and would jot down notes as I read on my phone. During the school year, most of my reading and blogging came from my phone, and I only used my laptop to really format the posts. Ah this is a hard one to write about because I’m writing this post a week before it goes up and by the time the post actually goes up, I’d have finished the book already and moved on to another one. So at the moment, I am reading Pulling Princes by Tyne O’Connell and What I thought was True by Huntley Fitzpatrick. I’m planning on starting Royal Dance by Rachel Branton and Between Dreams by Cynthia Austin soon. A couple re-reads I plan on doing soon include One Paris Summer by Denise Grover Swank and How it Ends by Catherine Lo. Ok so since I started blogging not too long ago, and I haven’t had the chance to attend any of the book conventions or events, the only book swag I have received is some bookmarks from Erin L Schneider, the author of Summer of Sloane. I want to thank Brooke for stopping in! I had a BLAST putting this post together and learning a little bit more about how you go about your days when blogging! I must say, your blogging area is slightly neater than mine! I clean it up for pictures and stuff, but when I am blogging, have the planner out, the colored markers and 30948398734 post it notes; it looks like something ransacked my desk! Thanks so much for sharing love!